There is nothing like wrapping my neck in a thick, cozy scarf on a cold winter day. Right now I wish could reach into my computer screen and put on the scarf from Simple Knit Shop pictured below. It looks like the perfect accessory to keep me toasty during the frigid New England winter that seems to last for an eternity. If I have to spend nearly five months of my year with winter temperatures, I might as well be wearing something so beautiful! Helen Flagg of Simple Knit Shop offers a wonderful assortment of eco-friendly, hand-knitted items made from natural fibers, from winter accessories to snuggly baby blankets to the cutest little dog sweaters. I am so excited to have Helen join me on my blog today! I started knitting almost 30 years ago. My first job out of college was waitressing at a sushi bar and next door to the sushi place was a knitting store, owned and run by a lovely woman named Claire. The shop was fabulous – it had a big oak table with chatty ladies sitting around it knitting all day, smooth wooden cubbies filled with gorgeous all natural yarns (no acrylics & no cheap synthetics), and Claire was a patient and good humored teacher. I fell in love with natural fibers, and really got into the rhythm of knitting. I also love math and knitting is a lot about math…sizing, stitch count, gauge, repeating patterns. 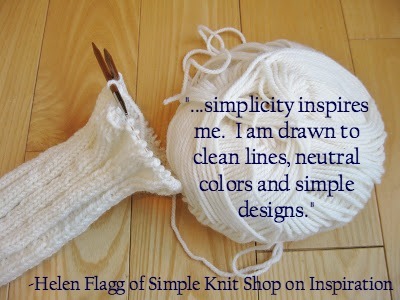 My Simple Knit Shop provides me with an outlet for my creative energy – I can try new patterns, new yarns, learn new stitches and enjoy my craft. My shop also lets me leverage my MBA and my business skills – I learn SEO, online marketing, pricing, photos & content writing. And having my own business is exciting – the thrill of a sale, the joy of positive customer feedback, the anxiety over a missing shipment. Always exciting, always something new to learn. Keeping up with new inventory is my biggest challenge. Hand made knits take time to make, often at least 20 hours of knitting goes into one piece, so I can go a week or two without adding new items to my shop. I try not to make the same pieces over and over again. Natural materials inspire me, and I love the texture of wool, alpaca and cotton fibers. When I shop for yarn I touch everything! Practicality also inspires me. I want my knit pieces to be functional, to serve a purpose as well as to be beautiful. And simplicity inspires me. I am drawn to clean lines, neutral colors and simple designs. When I purchase a hand made item, I appreciate the time it took the person to create that item. And when I give a hand made item as a gift, I hope that recipient feels like I cared enough about them to take the time to make them something special. I think time is precious. Can I have several favorites?? I have a friend who makes silver jewelry (she has a shop on etsy too) and I love the pendants & necklaces I have bought from her. And I have a friend who makes a wonderful Irish cream whiskey liquor; I am delighted to receive a gorgeous bottle from her every year as a Christmas gift. But my most favorite handmade items are the cards and art work that my children have made for me over the years. All the artwork that hangs in my office was made by my kids. When you are not knitting, what do you like to do with your time? My days are really full – I work full time in accounting & finance, and I have a husband and two children. I absolutely adore sports – watching, playing, going to games, cheering on my kids. Love the Pats and the Red Sox. I also love to travel, especially in the USA, there are so many terrific places to visit – we do a family road trip every summer. This past summer’s road trip included the Baseball Hall of Fame in Cooperstown, NY and the Rock and Roll Hall of Fame in Cleveland, OH. And I love music so I try to get some time on my piano or guitar as often as I can. Work on your business every day. Every day. Even if it’s just for an hour, work on some aspect of your business every single day. Make the time. Thanks for joining on my blog, Helen! Be sure to check out more of her work on her Etsy shop. I can’t believe Helen works full time and runs her knitting business! I love the scarf as well. She was so lucky to find someone who taught her like that. So nice. I know, she sounds like one busy lady! I admire anyone who can knit! Me too! My knitting skills are basically limited to things in a square or rectangular shape (i.e. I can make scarves, and if I have the patience, a small blanket). How cool! You must be proud of her hard work. oooh, beautiful, cozy looking pieces! I know! I just want to wrap myself in that scarf, especially since it just got cold again and snowy where I am. Auntie Helen is amazing in myriad ways!